After a long week of head to head Bowls in Edmonton, Michael Leong came away with the Men’s Bronze medal at the National Singles Championship. Leong slipped into the Bronze medal game after facing eventual Champion, Alfred Wallace, in the semi-finals. Wallace was an opponent feared all week and deserving of the ‘014 title, rarely missing a shot and winning in straight sets over Silver Medalist Keith Roney of Saskatchewan. The Alberta Bowler proved he is still one of the top players in the country even after a more than five-year hiatus from the game. Leong’s Bronze medal victory also came in straight sets against another Albertan player, Derek Dillon. After Leong made a heavily weighted conversion shot while down three in the head to sit one, Dillon was forced to concede the match early as it was mathematically impossible to win. 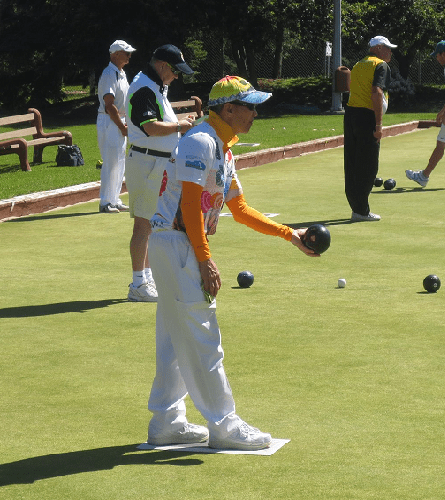 Provincial Men’s Champion, Malcolm Taylor, was knocked out by Roney in the round of 8 while Kin On Lau – last years’ National Bronze Medalist was eliminated in the round of 16. Still a great showing by both athletes against the 29 male competitors. B.C.’s women had a tough time. B.C. Champion, Marie Taylor, fell ill partway through the event even having to leave a game early. Pricilla Westlake, in her first National Women’s tournament, had a very strong start but racked up too many losses near the end of the 10-game round-robin and missed the medal rounds. The Women’s final had two of the top Bowlers in Canada battle it out in a three-end tie-breaker. Jean Roney became victorious after Harriette Pituley, down three shots in the last end, moved the jack slightly in the wrong direction. The shot for three was there but was missed by inches. And the Women’s Bronze Medalist Claire Day won over Christine Adams. Day, a veteran of the sport easily handle Adams in straight sets. The next National Championship will be the Majors Aug. 17-23 in Winnipeg. B.C.’s playdowns will start with the Fours July 4-6 at the Juan De Fuca Bowls Club in Victoria, followed by the Triples and Pairs. Also check back in a few weeks on bowlscanada.tv for archived footage of the Championship’s final rounds.